Elkhart Model Railroad Club -- Elkhart Indiana -- Close to South Bend, Mishawaka, Elkhart, Goshen, Middlebury, New Paris, Nappanee, Bremen, and beyond!!! Since 1950, the Elkhart Model Railroad Club has been a place where model railroad enthusiasts gather to work on the pike and run their trains. Some sections were hand-laid over 30 years ago. The mainlines were replaced for improved reliability. of fun at the railroad club. The Elkhart Model Railroad Club is located on Hawthorne Street in Elkhart and is within easy driving distance of South Bend, Mishawaka, Goshen, Middlebury, New Paris, Nappanee, Bremen, and beyond. Our members are from the surrounding communities and enjoy the many facets of the hobby. It really is the worlds greatest hobby. Our club is listed with the World's Greatest Hobby. Visit their Web site and learn more about this great hobby of ours. 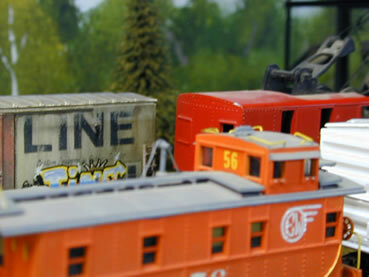 The site contains information about all scales and aspects of model railroading. Follow the Elkhart Model Railroad Club on Facebook. Be sure to look for "Friday Night Running" a weekly video presentation depicting scenes from the around pike. It can be found on our facebook page and is produced by club member James Ford... thanks Jim!